Our new recessed chandeliers with pearls are a beautiful addition to the crystal options available for our unique decorative recessed chandeliers. Shown below are 1-1/2″ Clear Crystal Tear Drops. It is also available with 1-1/2″ an 3″ U Drop Crystals. The decorative trim portion of the recessed chandelier comes in 14 Finishes. All of these options offer you a very custom decorative recessed light. The recessed chandeliers are a great choice for areas that don’t have a lot of recessed lights in the ceiling. Such as over the vanity in a master bath or powder room. Lovely in this Powder Room. Now they need a Beaux-Arts Classic Products Decorative Grille to replace the industrial vent cover! To cover a bathroom fan we provide a collar to raise the grille. Another great location fot recessed chandeliers are hallways. This hallway connects the kitchen to the dining room. The client had us match the crystals in the dining room. We did not use a chain. Please contact us for custom recessed chandelier options. This custom recessed chandelier uses Swarovski Austrian style crystals. The Antique Green is a beautiful color unique to Swarovski. 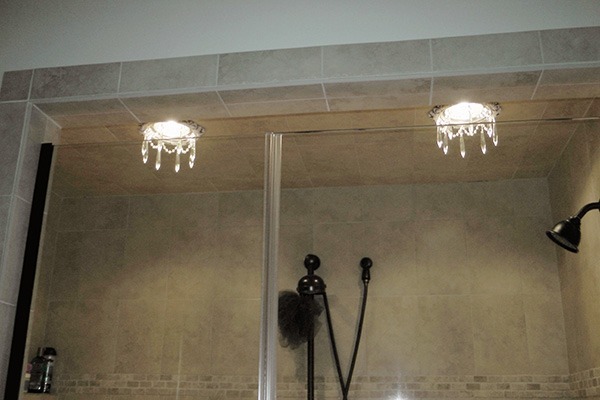 Since our decorative recessed light trims are appropriate in wet locations, try them in a shower. The large glass doors allow the recessed chandeliers to be seen and appreciated in this large walk-in shower. Look great over a soaking tub. Since we began offering our decorative recessed light trim for recessed lighting there have been a lot of changes and improvements. We have kept up with all the new sizes. We offer chandeliers for all sizes offered by manufacturers of recessed lighting; 3-3/4″, 4″, 5″, 6″, and 6-3/4″. An improvement to the functionality and appearance of recessed lights are LED lights. Reference our Blog, All About Recessed Lighting – The LED Miracle. We offer decorative options for the new 6″ wafer LED made by both Lithonia and Lotus Lighting. The improvement recently made to LED options is the wafer technology. LED’s run on direct current (battery current), so they do not produce heat and therefore do not need a canister. The canister was necessary to prevent the light bulb from touching insulation and causing a fire. The LED”S do not require canisters because they do not produce heat. So all you need to do today is cut a whole in your drywall and connect the electricity to a transformer. Next to make it look attractive add our 6″ Victorian decorative trim which is a perfect fit for a 6″ LED wafer and/or one of our recessed chandeliers.